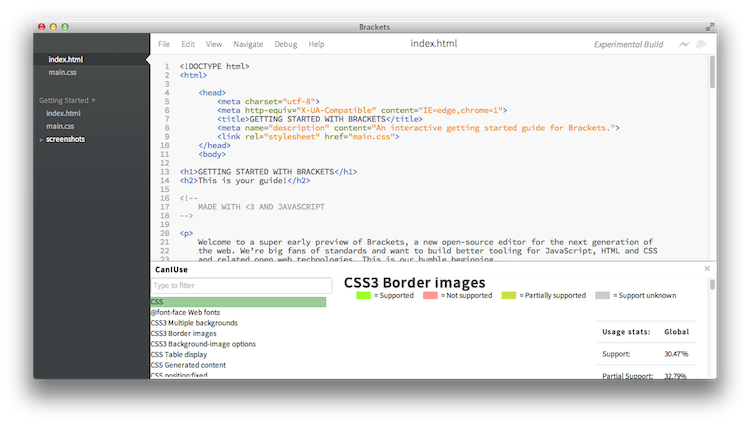 This weekend I began work on a CanIUse extension for Brackets. Given than I’ve already worked with the CanIUse data before, I figured it would be pretty easy. Within about an hour or so I got to the point where I could list out all the filters, allow you to filter to quickly find one, and then select a feature and get part of the report. I spent a bit of time attempting to get this working when Adam Lehman tweeted at me that Mustache.js was included in Brackets. Then, you simply use Mustache to compile the template and inject it as you would any other string. Here are two examples, a bit out of context. The first line shows my static HTML template (which needs no data) while the second is being used to display a feature object. Horrible, right? I’m still working my way through the extension to build everything as a template. 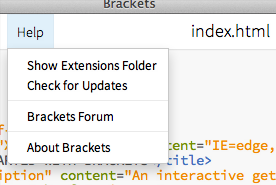 These two tips will make creating Brackets extensions a heck of a lot easier. In fact, I’ve got a little bug with my layout now. If I can’t get it fixed, later on I’ll be able to post the HTML/CSS by themselves for folks to give me a hand. Before today it would have been a lot more difficult for me to do so.